Shane Shirley : Isn't It Time We Know What's In Our Food? Tell the FDA to Label GMO's! Labels Matter Right? Isn't It Time We Know What's In Our Food? 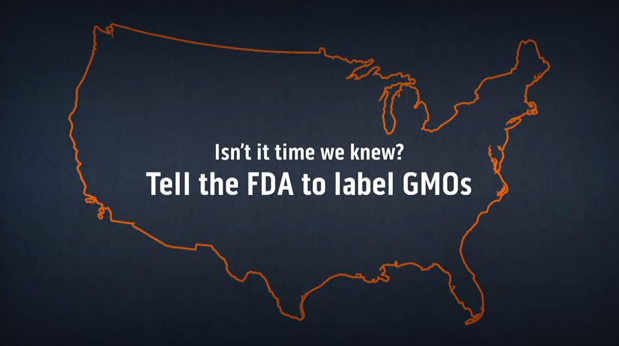 Tell the FDA to Label GMO's! Labels Matter Right? Since 1996, when GMO's (genetically modified organisms) were introduced to our food supply, consumers have been unable to make an informed choice as to whether or not to consume them. GMO consumption has been linked to organ failure, allergies, antibiotic resistance, birth defects, male infertility and cancer. Today, genetically engineered foods are served everywhere from restaurants to school lunch rooms and even unknowingly on your dinner table. Unfortunately, 88% of last year’s corn plantings in the United States were GM (genetically modified) and currently corn makes up a huge portion of the typical American diet. What do you think cows are being fed these days? If you are not investing in grass fed, organic beef, you are eating cows who were raised on GM corn. And did you know that an estimated 75% of the processed junk foods found at your local market contain corn, soybean or canola ingredients which have been engineered from genetically modified organisms. This includes bakery products, salad dressings, corn products, baby food, infant formula and other products made with HFCS (high fructose corn syrup). Isn't it time we know what's in our food? You do care what's in your food correct? I mean, labels really do matter to consumers right? "Before my daughter developed a food allergy, I didn't always think about what I fed to my kids. Afterwards, though, I realized just how food illiterate I'd been. Now I always check the labels on the food I buy - but not everything I need to know is there. The U.S. doesn't require labeling for genetically engineered foods, even though countries around the world - all of Europe, China and Japan - do. And some of these genetically engineered ingredients are designed to produce an insecticide and withstand increased levels of weed killer. While the jury is still out on the safety of these ingredients, we have the right to know what we're feeding our families. To make it happen, I joined the Just Label It campaign. Please take a moment to watch the video about my story by Food, Inc. director Robby Kenner and then sign EWG's petition to the Food and Drug Administration demanding that genetically engineered foods be labeled. Parents in other countries can make informed choices when it comes to feeding their kids. 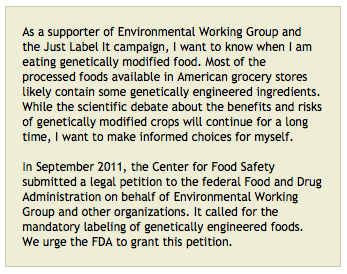 I hope you'll join me so that Americans will also have the right to know what's in our food. Our families are too important. As Monsanto continues to assert that genetically modified crops are safe, a recent study by independent Canadian doctors, has heightened concern. Genetically modified crops include genes extracted from the bacterial toxin Bacillus thuringiensis (Bt) to make them resistant to pest attacks. These genes make crops toxic to pests but Monsanto claims that they to pose no danger to the environment and human health. The Canadian study points in a very different direction, toward gene transfer from GM foods to cells of the body and to bacteria in the gastrointestinal tract, that the World Health Organization (WHO) says is of concern. Consumers have a right to know what we are putting on our dinner tables and feeding to our families. Please take a minute and tell the FDA that labels certainly do matter and we have a right to see them placed on all GM foods. Update 1-30-12: This story originally referenced the CDC and Morgellon's disease inaccurately. Thanks to some folks on Twitter (@BayaniMills and @Soymilk_Gun) I realized that I did not fact check the dates on my sources from the original story properly and I have removed all inaccuracies.